The Acer V7500 delivers an environment that's the most exclusive cinema experience into your living room, in Full HD. Realistic colors with sRGB gamut, Acer LumiSense + and superior sound - all this together ensures a memorable effect. Unroll the red carpet and enjoy a luxurious experience. The Acer V7500 was engineered for home theatres in mind and supports 100 percent of the sRGB colour gamut for better colour accuracy. It features Acer ColorPurity technology to reproduce rich and pure colours, combining a RGBRGB colour wheel with unique lamp control techniques, resulting in a wider colour gamut and reduced rainbow effects. The V7500 also incorporates Acer's latest LumiSense+ technology, which intelligently optimizes the image according to ambient light conditions and source image spectrum. The V7500 also features a built-in cable management compartment and central lens for easy installation. 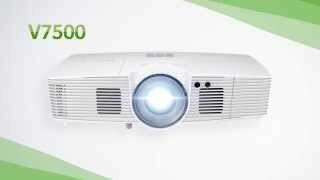 The Acer V7500 Full HD projector represents an unprecedented image quality! The secret is the RGBRGB color wheel and a new chipset, using the sRGB mode and a unique software. These combined give the Acer V7500 brilliant color rendering and image quality. The Ambient Light Sensor automatically detects the brightness of the surroundings and adjusts the image reproduction for optimal color quality. It's native Full HD resolution, 2,500 ANSI lumens brightness and contrast of 20,000: 1 make it the perfect device for gamers, enthusiasts and movie and football fans! The vertical lens shift and a 4 Corner Keystone Correction make setting up the projector easy.